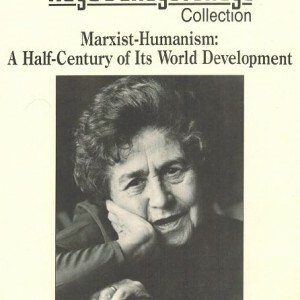 This is a pdf guide to the Marxist-Humanist Archives, with live links to the online documents at rayadunayevskaya.org, which comprise the 15 volumes of the Raya Dunayevskaya Collection and its Supplement. The Raya Dunayevskaya Collection encompasses 12 volumes—over 10,500 pages—arranged under the direction of Dunayevskaya herself. The Supplement to the Raya Dunayevskaya Collection—another three volumes containing some 6,500 pages—was arranged by the Raya Dunayevskaya Memorial Fund. All papers are on deposit at Wayne State University, which also makes both the Collection and Supplement available on microfilm. The Supplement includes notes for her planned book “Dialectics of Organization and Philosophy: The ‘Party’ and Forms of Organization Born Out of Spontaneity,” plus correspondence with Hegel scholars, analyses of ongoing world events, and “retrospective-perspectives” of the body of Marxist-Humanist thought. It also includes draft chapters, correspondence, and lectures all related to each of her three major works and Women’s Liberation and the Dialectics of Revolution.